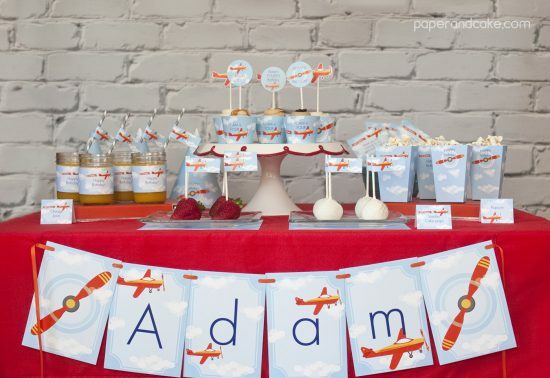 What do you get when you cross an Airplane themed printable party kit, glue and clothespins? Yup! 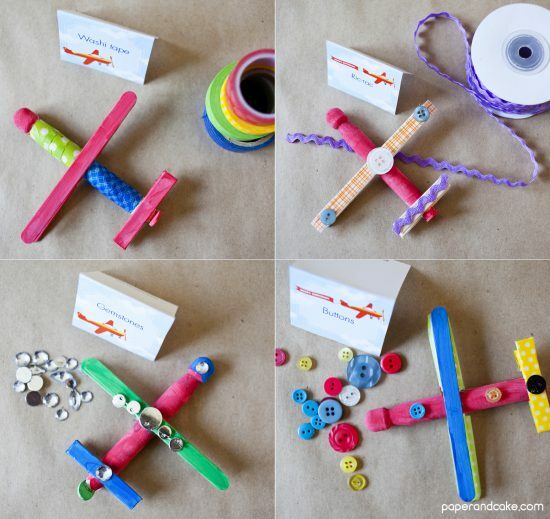 An Airplane Birthday Party Craft! Now, depending on the age of your party guests, you may want to prepare the clothespin airplane structures ahead of time. 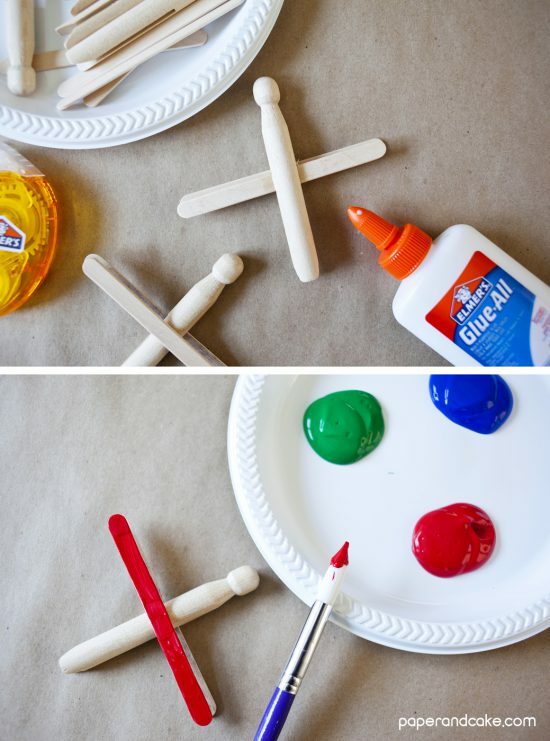 Adhere a popsicle stick to the top, and one directly underneath, using hot glue or craft glue. Set up your party crafting table by first affixing a protective cover (butcher paper, newspaper, plastic table cover). Set out all your crafting supplies either directly on the table, or group items in little baskets or trays. 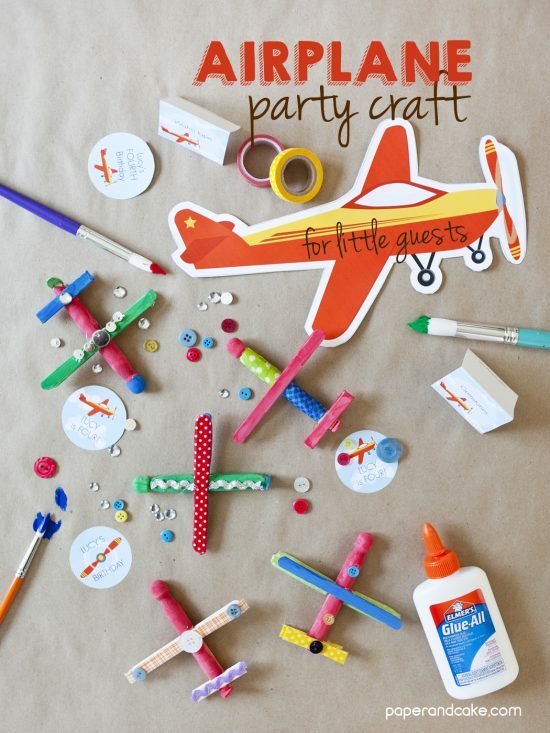 This is where you can add cute themed elements of the Airplane printable party kit! Put out the “party” food labels with names of the craft supplies, cut out some of the Airplane silhouettes and place them around the table. Again, depending on the age of your guests, have a couple (or a hundred) adults on hand to help put paint on plates and to keep the paint on the planes and not the other kids and walls and floor. Now comes the hard part…. let those kids be creative! Try (I know this is hard, for me) to let them decide what color to paint it, where to glue the embellishments and which embellishments the choose. They will have SO much fun with this no matter how long they spend on it – even if its just 2 minutes. Cute right? Easy, fun and inexpensive too! Get your party going, remember to check out our coordinating Airplane themed birthday party too! *Paper&Cake is a participant in the Amazon Services LLC Associates Program, an affiliate advertising program designed to provide a means for sites to earn advertising fees by advertising and linking to amazon.com.